The American economy is experiencing a seeming reversal of fortune following significant internal and external headwinds. The stock market, which tends to be a leading indicator of the economy, is back to 2011 levels. GDP and employment figures are also showing signs of slowing down. Some experts, including former President Clinton, have even suggested that current signals and trends suggest another recession is looming. Against this backdrop many are suggesting further fiscal (government driven spending or tax cutting) action be taken despite the national debt burden, or fiscal cliff, that faces the nation and its future generations. Here are some fiscal actions that the government will likely take if the economy continues to deteriorate. The so-called Bush-era tax cuts enacted in 2001 and extended by the Obama administration are scheduled to expire to expire at the end of the year. As shown in the table, the impact of the tax cuts will be significant and impact Americans across the board. In particular there will be a sharp rise in tax rates for investors and those in higher income brackets during 2013. 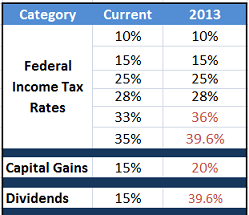 The top tax rate will return to 39.6% (or 42% if you include deduction phase-outs). Long term capital gains would be taxed at 20%, while dividends and short term capital gains would be taxed as ordinary income. According to the Congressional Budget Office (CBO) the risk of a recession is significant if President Obama and Congress remain at an impasse and allow several big tax increases and spending cuts to take effect at the start of 2013. But President Obama reiterated that he would only fully or partially extending the Bush-era tax by imposing higher taxes (referred to as the Buffet rule) on higher income earners. Otherwise, win or lose the election, he would veto any tax cuts extension. On the other hand, Republicans want to make the current tax brackets permanent, which would reduce tax receipts by more than $1 trillion over a decade, which would be added to our national debt. Avoiding [the recession] in the short run, by extending tax cuts and repealing automatic spending cuts, would hold its own economic perils for the long term by adding to annual deficits, the budget office said. By eliminating or reducing the fiscal restraint scheduled to occur in 2013 without imposing comparable restraint in future years would reduce output and income in the longer run relative to what would occur if the scheduled fiscal restraint remained in place. Estate and gift tax exemption increases will also end in 2013. The $5 million-per-individual estate-tax exemption will drop to $1 million, and the top estate-tax rate will rise from 35% to 55% for most and 60% for some. The gift-tax exemption will fall to $1 million and the rate will rise to 55%. Further, the AMT patch will also have to be extended next year or millions of Americans will be liable for higher taxes. A temporary 2% cut in Americans’ payroll taxes, effective in 2011 and 2012, will also end on Dec. 31. The so called payroll tax credit, which cuts an employee’s social security taxes for a potential saving of up to $1000, affects about 160 million Americans. Given the fierce debate that took place during its last extension, Congress will want to act swiftly on extending this credit in a presidential election year. President Obama, has indicated he is not against extending this credit to middle-class Americans, but again will not extend the credit for higher income Americans. Unemployment benefits were last extended in a tiered structure based on the recipients state unemployment rate. With the key focus being on jobs and overall economy, it is unlikely that any further extensions to federal unemployment benefits will take place in the near term. New unemployment program changes will primarily be driven by state level legislation and funding. The latest employment report, showing slowing job growth and participation for a third consecutive month, will surely make some Fed members want to take additional expansionary action. Those who oppose further Fed action claim that it is the government’s responsibility to overcome party based gridlock and set the environment for promoting economic growth. Though it is unlikely the Fed will sit pat and particularly with fallout from the deepening European crisis, it is likely we will see expansionary monetary actions later this year. The benefit to consumers is lower interest rates in the short term when it comes to debt and mortgages. Longer term though, expansionary Fed actions may cause inflationary pain, and many Fed officials argue that the benefits, in terms of reduced unemployment, are likely to be small. The hardened positions of the two parties on taxes and further spending – Democrats say higher revenue must be part of a deficit-reduction plan while Republicans say the U.S. should rely on spending cuts alone – are sure to make it an interesting and highly contentious second half of the year. I encourage you to subscribe via Email, Facebook, or Twitter to get the latest updates on tax changes and potential fiscal stimulus actions.